PLEA received word on 04/15/09 that Public Safety Manager Harris resigned his seat on the AZ POST Board approximately two weeks ago with no reason given. As a result, Phoenix, which is the fifth largest city in the nation, is now left with no representation on the AZPOST Board which is the certifying authority for law enforcement statewide. PLEA is unsure if this sudden and unannounced resignation has anything to do with the issue raised by PLEA regarding Harris’ ability to legally serve on the Board with regard to his position as “Public Safety Manager” as opposed to “Police Chief.’. PLEA spoke with City Council members, Mike Johnson, Michael Nowakowski, and Thelda Williams and discovered that none of them were aware of the situation. PLEA also learned that neither City Manager Frank Fairbanks, or Asst. City Manager Alton Washington were aware of the situation. The reason Mr. Harris resigned his AZPOST board position: he’s too busy. In speaking with City Council member Thelda Williams and the City Manager”s office, PLEA was informed that Mr. Harris resigned his board position on the AZPOST board because he has too much to do. Phoenix Police Officers and their standards and training needs. The men and women of the Phoenix Police Department have paid a high price in both life and limb to protect our citizens. These sacrifices brought great value and weight to the AZPOST seat. Those who pay a high price in law enforcement should have a voice in setting the standards. The needs and issues of the Citizens of Phoenix. Those who invest the most in law enforcement should be the ones who have a similar amount of weight on the police personnel they hire and the requirements that must be met to serve the community effectively. PLEA has never called into the question the importance of Phoenix’s seat on the AZPOST board. What PLEA did call into question was Mr. Harris’ qualification to serve on the board as a Public Safety Manager. AZPOST requires a Chief of Police to represent a city of over 60,000. Public Safety Manager and Police Chief are two completely different job categories in the City of Phoenix. Police officers frequently challenge the legality of conduct they observe – it’s part of the job. PLEA is now calling into question the reason Mr. Harris vacated such an important position over two weeks ago and did not inform his supervisors (the City Manager and the City Council). As he’s done in the past, Mr. Harris could have appointed someone on his executive staff to sit in for him at AZPOST meetings. As other agencies do who occupy seats on the AZPOST board (i.e. 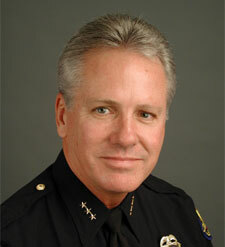 MCSO), Mr. Harris could appoint an executive police chief to represent the agency. Surely Phoenix citizens who pay Mr. Harris’ salary, the police officers who risk their lives, City Council members who serve their community, and the City Manager deserve more respect than the abandonment of an this important job-related post. Do we really believe that Mesa or Chandler or Glendale police chiefs will have Phoenix’s best interests in mind? Regrettable. Listen! to the phone message from Harris to PLEA with regard to vacating his AZ POST seat. CLICK HERE to read about the issues and concerns raised by PLEA in the past about Mr. Harris’ qualifications to serve on the AZPOST Board. CLICK HERE to see the current makeup of the AZPOST Board. (After web page opens click on the Board Members link). CLICK HERE to read the PPD policy with regard to reporting unusual activity to supervisors. Listen! to JD Hayworth talking about Harris AZPOST resignation.